Growing up in Montreal, there was never any need to pre-plan how you would spending saint-patrick's day; rain or shine, without fail, you would be at the parade. The morning would kick off with a tall guinness, coloured pancakes, shiny green spandex, and some awesome accessories from dollarama. I'd like to think that my palette has matured past green pancakes, but who am I kidding, I'd eat festive themed food every day if I could. We had some friends over for dinner this weekend, and I decided, in honour of St Patty's, to bake up a festive dessert - a simple chocolate cake with boozy bailey's glaze. Happy Saint Patrick's Day folks! This chocolate cake was divine: moist, rich in chocolate flavour and perfectly sized to not leave you eating chocolate cake all week (like that's ever a bad thing?!). If its not st patty's, feel free to switch up the icing if bailey's isn't your thing; chocolate whipped coconut cream, cashew coconut cream, or a honey cream cheese icing - to name a few. Combine all the dry ingredients in a large bowl. Be sure to push through any lumps. In a separate bowl, whisk together the sugars, buttermilk, oil and vanilla. Transfer batter into a greased or parchment lined baking pan and bake for 40-50 minutes until a toothpick comes out clean. Allow to cool completely before transferring to a wire rack. To make the glaze, combine all the ingredients in a bowl and whisk. If its too solid, add more bailey's; too liquidy, add more icing sugar. 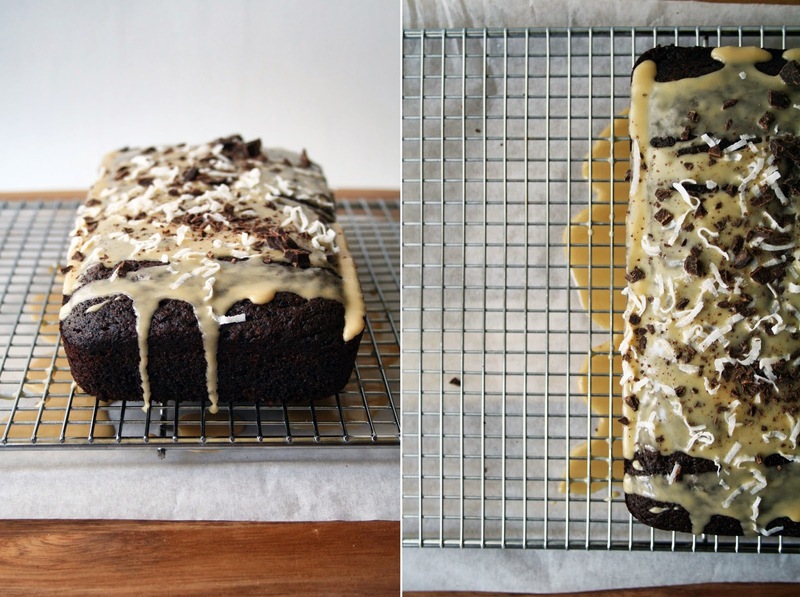 Once the cake is 100% cool, pour the glaze on top and drizzle with coconut and chocolate.